This was a fun, fast, and easy pizza to make--and to eat. I'm sharing this today in part because while I find it pretty easy to throw together pizza dough most weeks due to near-constant practice, I know that making your own dough can seem very intimidating (pie crust intimidates me). That's a big reason why I brain-dumped my Pizza Primer blog post, to demystify the whole thing. But I don't always make my own dough--or buy a ball of pre-made dough from the store. Some times I get pre-baked pizza crusts, like here or here. And sometimes, I'm in the mood for pizza without all the pizza crust foolishness. Plenty of folks rave about naan or pita pizzas--they sound great to me, if only my kids would save me some naan. Milk and naan--they don't stick around in our house waiting to be consumed. Reminds me--I'm thinking the Indian-spiced slow cooker patty pan and beef dish to appear on Monday? Yes? No? Back to pizza . . . 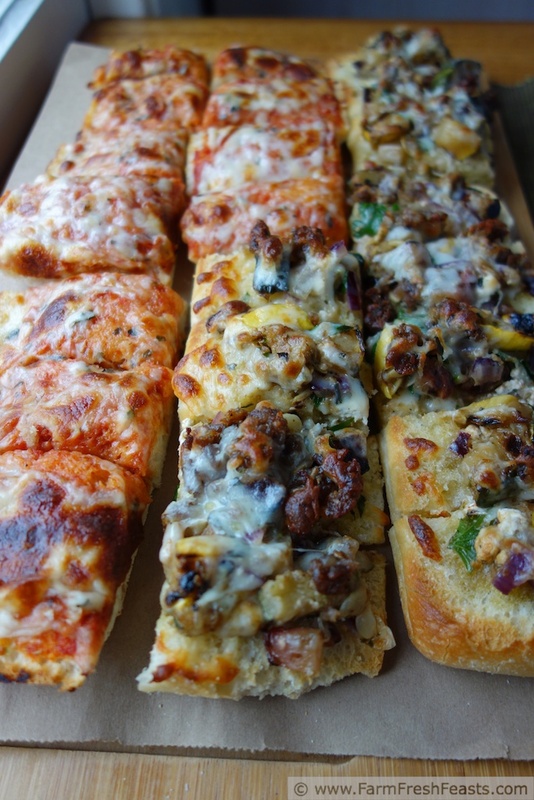 I like to experiment with different breads for our pizzas. You know French bread pizzas? When I make them, from a loaf of day old French or Italian bread (I still call them all French bread pizzas after Stouffer's started the trend for me) they are usually too thick and too hard to bite after baking. I do love how easy it is to make them, though--no dough skills or extra time necessary--so I keep on trying. When I saw take & bake ciabatta bread marked down, I initially wasn't thinking pizza, but when a recent Friday afternoon loomed and I didn't have dough made, inspiration struck. Using the par-baked bread means that the crust is just crisp enough when the toppings are warmed and the cheese is melted. This crust is an excellent vehicle for a wide range of toppings--but to keep it on the easy side, check your refrigerator. You've grilled veggies this summer, right? Got any leftovers? I tossed my leftover veggies (zucchini, yellow squash, bell pepper, radish and red onion) with goat cheese, fresh parsley and a bit of cooked sausage and used that as one of my toppings. Just plain cheese on the other half for those in the household who aren't embracing the grilled veggie concept. Yet. I'm working on them her. I think this would make an excellent appetizer, or an excellent pizza for a party--you throw it together in minutes, shoot, it takes longer to preheat the oven--and each half can be its own blank canvas to decorate as you desire. Read the bag that your bread came in for what temperature to preheat the oven. Mine was 385 degrees Fahrenheit, so I preheated my oven and pizza stone to that temperature since for once I've got a digital oven. High falutin'. Slice the ciabatta loaf longways, as shown, and brush olive oil on the cut sides. In a medium bowl, combine grilled veggies, onion, parsley and optional sausage, if using. Set aside. 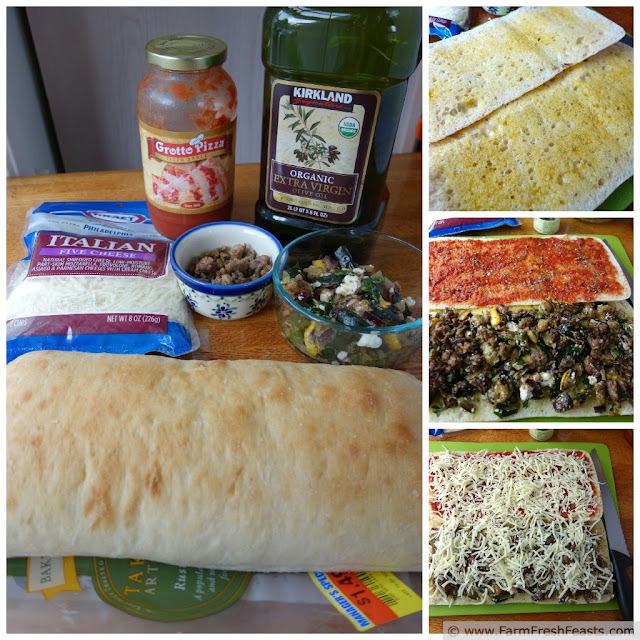 Top ciabatta with pizza sauce, vegetable mixture, and cheeses. Shake pasta sprinkle or Italian herb blend over top. Bake according to the directions on the bread bag--I baked my pizzas for 8 minutes, directly on my pizza stone though a cookie sheet would be just fine. Cool a few minutes, then slice and serve. Good with a blueberry margarita, if you've got blueberries and margarita fixings and plenty of ice. This pizza is joining the party at the From The Farm Blog Hop, the Clever Chicks Blog Hop, Tasty Tuesdays, Mostly Homemade Mondays, the Wednesday Fresh Foods Link Up, What's Cookin' Wednesday, and What's In The Box. This is a brilliant idea! I'm thinking mini-pizzas made out of the take-and-bake garlic rolls from Trader Joe's. Also, I just have to say, we may be food soul mates-- leftover veggies at the end of CSA week in my house always become either pizza or sushi rolls! TJs rolls would be amazing--and now I've added a 5th thing to the Trader Joes list so I guess it's time for a trip! I'm so glad I'm not alone in my 'use up the leftovers' obsession! Okay, now I think I am in love with you. Why didn't I ever think of using the par baked bread to make a pizza? Would it be okay if I rushed out of the house this exact moment to get some par baked bread from TJ's so I can have this on my plate tonight? I would be ok if you rush out of the house provided you leave it unlocked so I can snag some of your heirloom tomato sauce while you're gone! I hope that didn't sound stalker-y. You're hours west of me, you could totally be back before I'd make it to Illinois, even. This is brilliant! I never think to make pizza with anything except traditional crust (either homemade or store-bought) and need to experiment more with ciabatta, naan, pita, etc. This looks SO flippin' good - you're making me hungry now! Well, we're even since I'm still drooling over your salted caramel chocolate chip cookies. I am copying from above comments, but this is brilliant! Thanks for the great idea! Perfect for hot summer day pizzas! Thanks! I love this idea for so many reasons, but the main one is using up leftovers. What a great way to repurpose your food. Reduce, reuse and recycle indeed. Now to figure out how to make the bread; it can't be that hard. Seriously. The idea of baking ciabatta doesn't scare me. I mean, I make focaccia and they have a lot of similar vowels, so it can't be that hard, right? The INTIMIDATING part is how to par-bake it enough that you could slice it, when cool, and then finish the job without having the bread be too tough to bite through. I don't think I could eat pizza every day, but nearly every day--especially if I was eating pizzas I loved from all over the world (meaning, someone else makes some of them) as well as my own creations. 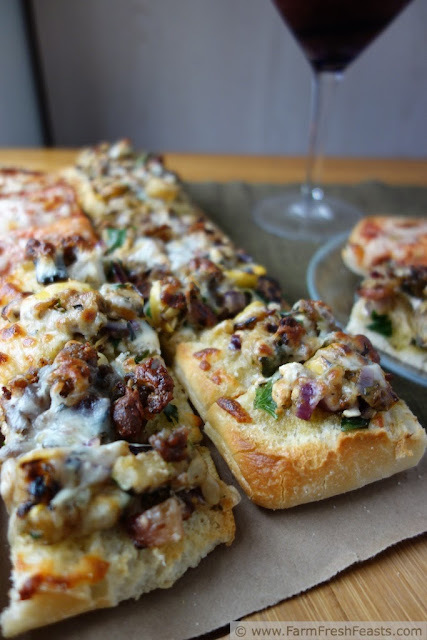 I love ciabatta bread and I know this pizza would knock my socks off! Thanks for linking up with What's Cookin' Wednesday! This is SUCH an awesome idea, Kirsten! I cannot wait to make this pizza for my family. I've had frozen (GASP) ciabatta pizzas but never thought of going to the bakery and getting my own ciabatta and doing it myself! 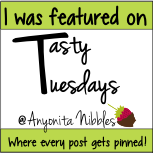 *headdesk* :) Also, I wanted to thank you for sharing with us at Tasty Tuesdays & let you know that you've been featured this week! Congrats! I could dip a giant loaf of ciabatta bread into roasted garlic, herbs, and olive oil and call that dinner. I love bread! Or, you know, make a pizza or something. I've been doing this for a while with part baked baguette but I gotta try it with ciabatta some time! Oh, I bet a baguette would be terrific for a party--I can just see it on display like a long submarine sandwich usually is. Thanks for stopping by! That looks delicious. We often use tortillas for quick pizzas, but ciabatta bread would make it more filling. Thanks for sharing!